(주)유니오텍의 소식과 업계 동향을 확인할 수 있습니다. The new Optotune ML-20-37 manually tunable lens is designed to have its lens curvature change between convex (+18 dpt), flat (0 dpt), and concave (-18dpt) through rotation of the outer adjustment ring. This allows for the focal length of the lens to be tuned to the precise value required for an optical application. The rotation mechanism is extremely durable, low torque and linear. Optotune's manually tunable lenses provide a simple, cost-effective solution for applications where system parameters are still being decided, such as in system prototyping or R&D applications. 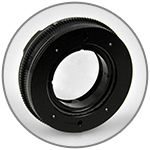 The ML-20-37 lens is available with and without C-mount adapter. 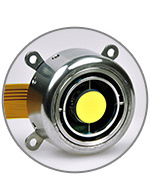 Optotune developed resonant versions of the popular MR-15-30 dual axis mirror. One version with a single axis resonant mirror and a second with a linear axis combined with a perpendicular resonant axis. Main applications evolve around raster-scanning a laser beam, e.g. LiDAR, OCT and confocal microscopy. Engineering samples with frequencies of approximately 280 Hz are available. The resonance frequency can be customized. To learn more and see it in action visit our Photonics West booth #6033 (north hall). 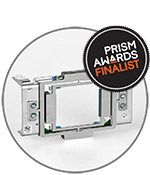 Optotune's extended pixel resolution actuator XPR®-25 is nominated for this year's PrismAward! The XPR®-25 4-way actuator is used in projectors to increase the perceived resolution 4 times by shifting the image precisely within one frame. Apart from projectors, the XPR®-25 also finds application in cameras, 3D printers, metrology systems, etc. to achieve super-resolution. Contact sales@optotune.com to setup a meeting! Optotune develops and manufactures industry shaping active optical components that allow customers around the globe to innovate. Founded in 2008, we started out with our core technology of focus tunable lenses, which was inspired by the working principle of the human eye. Laser speckle reducers, 2D mirrors and tunable prisms are further additions to our product lines. Thanks to our deep understanding of optics and mechanics and a passion for technology, Optotune is your ideal partner when it comes to solving challenges where conventional optics fail.